So, for almost a week now, I'm using the Linux Mint 17 "Qiana" KDE version. As a Mint 16 User I had some expectations about this version. First I tried a package upgrade, which is still not recommended, and therefore not really supported within the system. Again, changing the repositories to the new version (trusty replaces saucy, and qiana replaces mint) and upgrading the system (forced by using sudo apt get -f dist-upgrade 3 times after some non-critical errors(!) ), everything seemed to work. Made some test, all good. But I didn't like the way it looked. 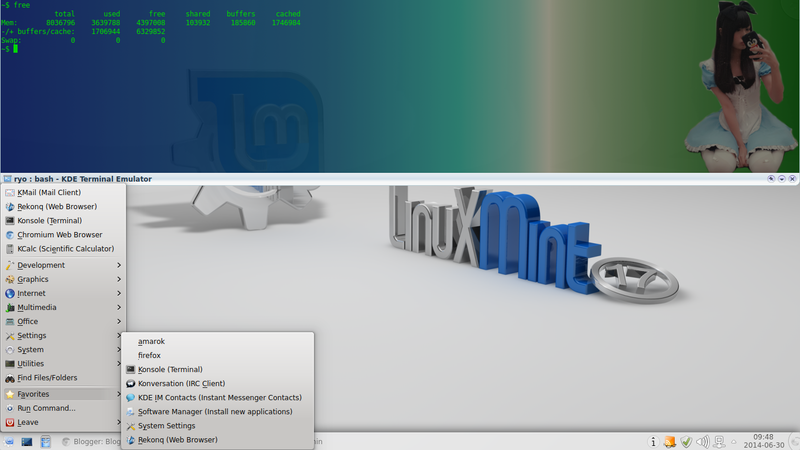 I also used not the KDE-version of mint, but KDE installed on the Cinnamon version. So you can imagine that I had some chaos in the menu and obsolete programs installed, even before the upgrade. Backup, installation, nice new look, all went good and without problems. But then there was the restoring of the data. I restored settings of some programs, KMail and so on. But what is this? Addressbook empty. KMail without accounts. So, I restored the Akonadi config and data files. Then the complete Akonadi system failed, Kmail didn't startup and so on. So I removed all the files again, and set up all from scratch. Then I wanted to import my local mails into Kmail and... Kmail did not restore it. It couldn't read it's OWN maildir correctly. Mails were missing and the structure was horrible. Not nearly like KMail did on mint 16. So I couldn't import my mail correctly, even trying for hours. I gave up on that. The messages are still available to browser through with Dolphin in the directory I backed up from the old KMail. By the way, uninstall programs you have in your favorites only AFTER removing them from the favorite list. Else you can't remove them anymore (see screenshot above). Even tried to edit the kickerrc manually. Get changed back automatically. I'm sure there will be a workaround, but that's not how it should be. Also in the screenshot above in the terminal window, you can see another bug. Not from Mint, but apparently from Ubuntu 14.04. Some users seem to have problems with it. The encrypted swap doesn't work. you can get it to work for the session, but after reboot it's gone, despite it's in fstab and crypttab correctly. Well, I hope canonical will fix this soon. It might help to use /dev/sdax (your swap partition) instead of the UUID. Then I experienced a little bug of the clock in the panel. It switches back to show the UTC time, despite it's set to "local". If I open "digital clock settings" -> "Time Zone" it says local. Just press okay and it get changed back to the setting. This changes with unknown reasons. Very annoying. Still a problem: Wifi connection with a hidden network (hidden ssid). It#s unbelievable that in 2014, it's still not possible to enter a hidden network with any headache. You need to open a terminal then sudo iwlist wlan0 scanning essid SSID , where SSID is the name of the network to connect to. Then you can open the network manager in the tray and enter the password there, and it will work in the future. You don't have to do this again. Then you can select ogg within soundKonverter. This is very ugly, and I can't understand it. Instead patent-encumbered mp3 is working out of the box? Give me a break. You can do this of course. MP3 is the most used format. But leaving out Ogg vorbis is unacceptable. I hope this is only a bug. Boooh! And why the hell is there no Konqueror installed by default? Unbelievable. After doing these things, you have a nice system running, with good performance. Positive things are the nice new look and it now let's you install the nvidia driver for 740M with dual graphics (Intel GMA). It wasn't recognized in Mint 16. That is a good thing. However I decided to stay with the open source variant, which is installed by default. It's good enough.